Have you thought of everything? Have you thought about too much? Those who have already attended a camp know exactly what is required. Those who have not yet taken part in a camp, finds it difficult to pack the right things. The parents pack far too much or don’t pack one or two important utensils at all. Some parents are astonished and ask why the kids only need to take 2-3 t-shirts and not 7-8 t-shirts. Quite simple: The items listed below are adequate – we have experience. On a hike, every extra gram weighs you down. The group members don’t need to slip into a new outfit every day when they are camping. Replacement clothes are important, dependant on the weather at the time. In certain situations, an extra pullover or an extra pair of trousers can be packed dependent on the weather forecast. (Length: approx. 5 days. The list must be adapted according to location, length of time, time of year and the age of the group members). Please be aware of the weight, 1000 gram sleeping bags do not cost the earth. Eiderdown sleeping bags are not always the best idea. Anyone who sweats in the sleeping bag will not have the time or possibility to air out the bag on a hike. Choose a hard-wearing; cotton on the inside and the outside is made of (water repellent) polyamide. Food, plate, Gas burner and a few others things are shared out among the group members. The weight of the rucksack should be around 12 kilograms. 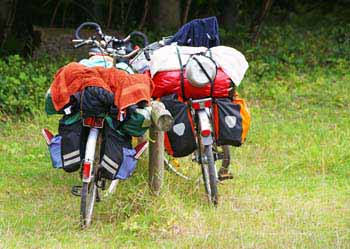 If 2-3 people work together the weight can usually be reduced on average to 10 kilograms (poncho, sun cream, tooth paste, torch, plates and burner can be shared between members if they communicate with each other). The least weight we have recorded was 8 kilograms but some kids managed to bring everything and the kitchen sink and easily reached 20kg and more. There will always be parents who think that they are doing something good for their child….and pack a little more…we can’t have our little darling freezing to death, or starving or not having enough clothes. Practical packing means quickly being able to find things and less stress. Heavier things should be packed on top (then the weight does not put pressure on the small of the back, it puts more pressure on the shoulders) and away from the back (at the front of the rucksack). A rucksack which is not well packed wobbles around, annoys the hiker and hinders others. Medication, paperwork, bible and mobile phones should be protected from moisture. 1 warm sleeping bag (or a second sleeping bag), 1-2 old blankets, 1 roll mat (no air beds please), 1 jogging suit, 2 old (jeans) trousers, 2 warm pullovers, 1 rain and windproof warm jacket, 1 pair of sturdy shoes, which do not fill up with water if it rains, (woolly-)hat, underwear etc., 3 pairs of socks, Unbreakable deep plate and cup, knife, fork, spoon, hand towel, torch, scarf, washing kit, toothbrush, bible – everything packed together in a sports bag. Please also bring your medical insurance card, which we hopefully won’t need. If you need any medication, please add them to the list and inform us. 1 sleeping bag, 1 roll mat (no air beds please), 1 jogging suit, 1-2 pairs of long jeans or zipper trousers, a pullover, 1 rain and wind proof jacket with hood, 1 pair of good sturdy (walking) shoes, flip flops/sandals if necessary, 1-2 shorts, 3-4 t-shirts, 3-4 underpants, 3-4 pairs of socks, Unbreakable deep plate and cup, knife, fork, spoon, little hand towel for washing up, Medium sized towel/hand towel, small torch if required, scarf, washing kit, tissues, sun cream, sun hat, moisturiser, 2-3 plastic bags for dirty washing and for protecting clothes against rain, large plastic bag to protect the sleeping bag from the rain, lighter, pocket knife, 1 unbreakable water bottle (canteen etc. ), 2m long rope (e.g. tent rope) or, even better, bungee straps for tying the roll mat and sleeping bag and other luggage. Everything together should not be heavier than 10 Kg. Everything should be packed in a large bag (we will leave it in the car while we are on the hike) and the below items for the hike will be taken in a rucksack. Please separate the items before the camp. Please also bring your medical insurance card, which we hopefully won’t need. Copy of ID card/school ID card, inoculation pass (or copy); do not forget pocket money (approx. 80.— 110 Euro). We can ration the pocket money upon request. The following luggage will be shared out among the participants for the hike (per person approx 2-3 kg. ): A 2-piece tent pole, 1 poncho, approx. 4 tent pegs, tin opener, rations, first aid box, toilet paper, bread and plate or gas burner. We will share these out among the participants a few days before the camp. 2x change of t-shirt, either 1 pullover or 1 sports jacket, 1 pair of jogging trousers, 1 light pair of shorts, 1 change of socks, 1change of underwear, 1 small hand towel, 1 bathing suit, sun hat, sun cream, 2 plastic bags (for dirty clothes and for protecting sleeping bags from the rain), rain coat, cutlery, drinks bottle, lighter, sleeping bag, roll mat, bungee straps or 2-3m long piece of rope (no parcel string please) to tie the roll mat or sleeping bag onto the top of the rucksack. The complete weight should be around 8-9 Kg including sleeping bag and rucksack. Another 2-3 kg will be added for a poncho, tent pegs, tent poles, plate or gas burner. Try out ways of saving kilograms (e.g. a smaller towel, a smaller tube of toothpaste instead of a large one, a pair of convertible trousers instead of a pair of long and a pair of short trousers, no plate for the hike, why do we need a beaker? We don’t really need a torch for the hike either and, and, and). Sleeping bag, roll mat, change of clothes and socks, hand towel, rain coat, Wellington boots, sturdy shoes, jogging suit, knife, fork, spoon, beaker and plate, dish towel – all packed in a sports bag or rucksack. Please put your name on your sleeping bag and roll mat etc.